Technological advancements and the emergence of social media apps as well as trends like BYOT (Bring Your Own Technology) and BYOA (Bring Your Own Application) have been changing the workplace and the way employees perform their daily activities. In today’s workplace, a typical employee can use a variety of tools to get work done from business apps, collaborative solutions and even social media platforms like Facebook and Twitter. Enterprise ready solutions designed to facilitate work within organizations and help employees to communicate and collaborate came a long way from traditional intranet portals and e-mail to what is currently known as the digital workplace. Over the last few years, we have witnessed new technologies take form in this field. Software vendors seem to be in an endless quest to come up with new technologies that address the changing dynamics of the modern workplace, meet the growing demands of organizations and the expectations of an emerging young workforce consisting of millennials and generation Z. 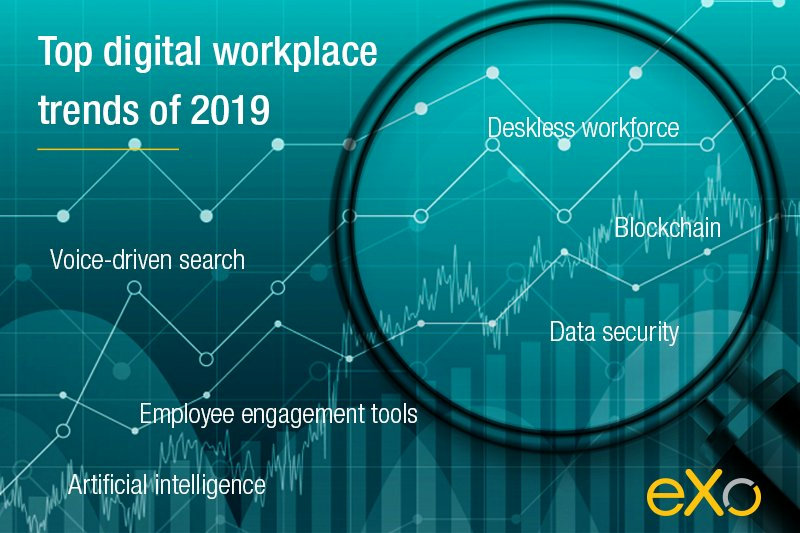 Below is a take on what the digital workplace trends of the year 2019 appear to be. Artificial intelligence technology gathered a lot of momentum in the last few years. IT behemoths like Microsoft and IBM invested heavily in this technology to respond to growing demands centered around AI and to make systems that are smarter and more effective in tackling different needs. According to Gartner, it is expected that by 2022, one in every five workers engaged in non-routine tasks will be relying on AI to do their jobs. Further investments in this are expected in 2019 as digital workplace solution providers begin to introduce AI and machine learning to their products in order to improve user experience, knowledge management and employee efficiency. Digital workplace solutions are increasingly addressing organizations’ needs to better engage their employees. Over the years, businesses have been shifting from traditional corporate intranet portals with pure top-down broadcasting and consumption of content to modern collaborative platforms that are comparatively more user centric, engaging and promote easy communication and collaboration. This shift was triggered by the realization that traditional top-down-focused communication tended to exclude the rich potential for involving and engaging employees and led to many inefficiencies that outdated intranets suffer from. As a result, things like smartly-integrated enterprise social networking, gamification, employee recognition and rewarding tools as well as engagement analytics became very important in a digital workplace, at least in our eyes and based on our experience here at eXo. 2019 can see further advancements with the introduction of smart and innovative ways to engage employees, encourage and reward desired behaviors in the digital workplace. Virtual assistant technology has already made its way to consumers’ homes around the world and has been showing fairly favorable reception from the public. From Google Home to Amazon Echo, the technology is embraced by some big tech vendors who are willing to invest significantly in it and drive consumption of their offerings. It is a matter of “when” not “if” that voice driven search will also become mainstream and available to businesses. Amazon invested heavily in the technology by introducing Alexa for Business. Voice recognition technology can help organizations leverage new possibilities like virtual assistance in order to make it easy for employees to search and find information while replacing traditional search methods with more easy ones. Data security has been taking center stage during the last couple of years as more and more businesses are turning to cloud based platforms to store data. It has become increasingly common to opt for digital workplace solutions that allow secure storage and exchange of data and that align with long-term visions of organizations. 2018 saw the introduction of new laws and regulations, such as GDPR in Europe, that significantly changed how companies process and handle data and give greater protection and rights to end-users. Growing interest in this area and the introduction of new laws and regulations (evidently with effect to digital workplace solution providers) can be expected in 2019 while we continue to witness the questioning of large tech corporations like Facebook and Google by governmental bodies and lawmakers. According to the “rise of the deskless workforce report”, 80% of the workforce is deskless. On the other hand, traditional intranet portals have been aimed and designed to respond solely to the needs of in-office employees. This obviously led to field workers being disengaged and disconnected from their workplace and having a lower sense of belonging and digital collaboration culture. The situation has changed in recent years with technological advancements and the changing dynamics of the workplace. Millennials now make up the most of the workforce in established and ever growing industries like retail, manufacturing and construction. Being tech savvy and exposed to the latest trends, this generation demanded new technologies to facilitate the way they connect with each other at work and perform their daily activities. Businesses started to adopt digital workplace solutions that are available on mobile devices to drive engagement and facilitate collaboration between in-office and onsite employees. Investments were also made in enterprise social networking and built-in conversational, internal community and discovery tools. Continuous investment is expected in 2019 with digital workplaces technologies like full-featured workplace mobile apps, enterprise social networking and built-in video conferencing. Digital workplace solutions evolved over the years to respond to the growing and continuously challenging demands of organizations. Every year we witness stronger evolutions from the traditional corporate intranet portals to smartly-integrated collaboration and employee engagement platforms. With technologies such as artificial intelligence and blockchain to name a few, the possibilities seem to be endless. Companies can begin to leverage state-of-the-art digital workplace software to better engage their employees. Chatbot: Why it is not AI? I am a product marketing specialist at eXo. My role is to assist marketing and sales teams in their operations and present our digital workplace solution to the world. 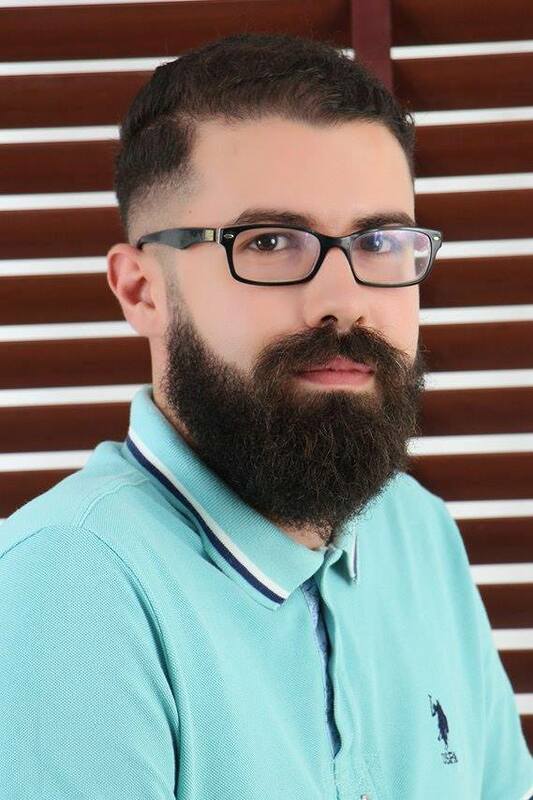 I mainly blog about the latest tech trends, digital transformation, internal communication and how to navigate through eXo Platform.